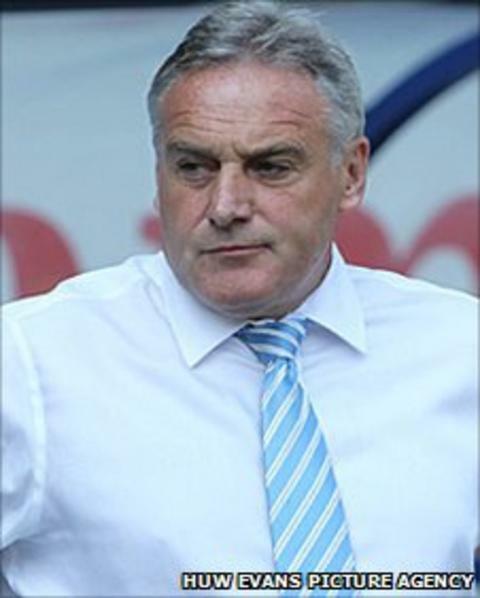 Dave Jones says some critics' attitude to their efforts is "unbelievable"
Cardiff City boss Dave Jones says he feels let down by five players who "socialised" ahead of last week's 3-0 defeat by Middlesbrough. That loss helped deny Cardiff automatic promotion and they now face Reading in the play-off semi-finals. "Everybody feels let down, me included, but one of [the players] that was out wasn't even drinking - [he was drinking] coke or whatever. "But it's the timing of it - that's the sad thing," said Jones. The manager explained that players are allowed to go out up to 48 hours before a game and confirmed five players are so far known to have socialised in Cardiff on Friday 29 April, before the game against Middlesbrough on Monday, 2 May. He added: "They know they shouldn't be out on a Friday night when we've got a big game on the Monday." Jones and fellow club officials are still investigating the allegations. He said: "There were certain players out on the Friday - a couple that played and the rest that didn't play - five in total as far as we know." Jones added: "The players know where I stand on it ... out of a squad of 22/23 players you're looking at a couple [who socialised] that were playing and the rest weren't playing. "So we've just got to make sure that we do [the investigation] right and that will be dealt with when we think it's the right time. "But at the moment we are just purely concentrating on a play-off spot. After Saturday's 1-1 draw with Burnley, Cardiff finished fourth in the Championship, one place behind Swansea City, who face Nottingham Forest in their two-leg play-off. The Bluebirds go to Madejski Stadium on Friday, 13 May with the return leg at Cardiff City Stadium on Tuesday, 17 May. Jones hit out at those who criticised the team for failing to win automatic promotion, saying pundits should laud the Bluebirds for again being in contention for promotion and describing their attitude as "unbelievable". He added: "It's another fantastic achievement for this club to get to the play-offs. Three of the teams that got relegated [last season] aren't anywhere near it. "You've got teams that have spent a lot of money that aren't anywhere near it. It's still a good achievement and I've never known such disappointment in my life at some of the things that are being said of late. "Players are disappointed we didn't go automatic, but I tell you what - so are another 20-plus clubs as well. "We're in a great position to try and have a go."